Offering you a complete choice of products which include rubber matting, commercial rubber mat, insulated rubber mats, rubber cow mats, rubber mat roll and interlocking mat. 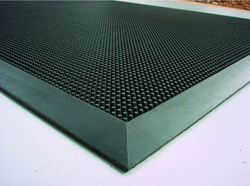 We have attained expertise in manufacturing, wholesaling, retailing and exporting Rubber Matting. The entire range we bring forth is designed and made by skilled professionals, making use of high grade rubber. Used for handling raw products in the industrial sector, these products are provided in different sizes and specifications. Innovation, being our forte, is always followed while manufacturing Commercial Rubber Mat. The mats we offer are designed specifically for meeting demands of the commercial sector. Clients appreciate our range for its high tensile strength, smooth finishing and dimensional accuracy. Furthermore, with the help of our wide distribution network, we have been able to make on-time delivery of ordered consignments. 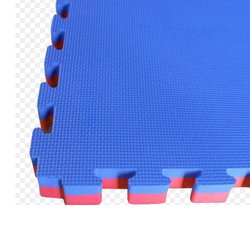 We are the foremost supplier, trader and wholesaler of Insulated Rubber Mats which are developed and designed skillfully. 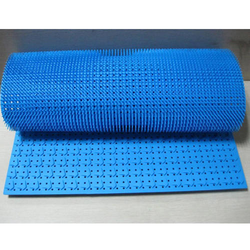 These mats are widely used in front of high voltage devices and switchboards due to their good functionality. 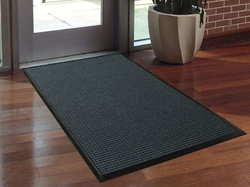 In addition to this, these mats are constructed precisely from high grade material procured from our most trusted and certified vendors. Reliability is the hallmark of our product. 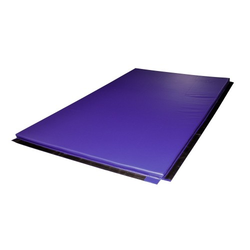 We offer Rubber Cow Mats that are widely used in stables, animal vans, etc. These have been designed to provide utmost comfort to the animals. They are impact resistant and have a long shelf life. These have cushioning effect to enhance the comfort. They are made available in standard as well as customized sizes, as per the instructions of our customers. These are made available at market leading prices. 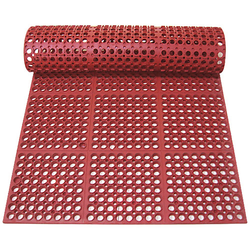 Rubber Mat Roll offered is general purpose industrial rubber that finds use in different application areas like as flooring runners and others. Providing for longer wear life and in the pressed cured finish, these mat rolls also provide for superior resistance to mild chemicals, chlorinated and sea water, oxidation and others. Some of its features include superior flexibility in cold temperature environment, superior toughness to wear and tear, suitable for use in flooring and wall coverings, providing for excellent durability support, providing for superior surfacing for areas requiring resilience, perfect for indoor as well as outdoor use, made of 100% premium rubber and others. Interlocking Mat offered can be offered by us in different choice of materials and feature easy and more convenient installation support. Here, our expertise lies in making these mats available in options of rubber, foam, plastic and other options with advantage of no adhesive requirement for their installation. Some of its features include availability in different sizes and thicknesses, choice of different colors, easy to install using interlocking edges, non-toxic material choice, providing for perfect cushioning support, suitable for use in safety and anti-fatigue applications, suitable for use in workshops, exercise rooms and gym areas, suitable for use in children's play areas and others. 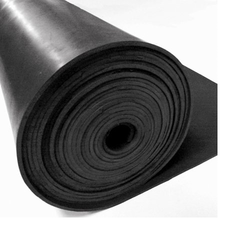 We are leading manufacturer and supplier of Insulation Rubber Mat. It is manufactured using quality raw materials and latest technology. Furthermore, these products are checked on various quality parameters to ensure its defect-free nature. Industrial Rubber Mats offeredcomes in superior construction finish and find suitability for achieving comfortable and healthy work environment. Featuring best quality finish, these rubber mats provide for superior waterproof usage as well as meet the demands of anti-shock performance. Some of its features include offering superior sealing performance; choice of different hardness and elongation support; rubber sheet meeting/exceeding ASTM specifications; coming manufactured under strict guidelines. Anti Static Mat offered can be made available by us in different colour options of green, blue, grey. Further, these mats can be provided with the superior surface resistance of upper and underlayer. Some of its features include the provision of shiny/dull finish; having high-temperature resistance; coming constructed through vulcanization process with rubber as main material and reinforced materials like fabric, metal sheet and others; can also be developed in OEM configuration choices. Rubber Bar Mat offeredcan be made available in customized sizes and artworks as demanded by the customers. We can offer these mats in different colours and text/logos options as demanded from us. Some of its features include product developed as per industry certifications; option of die-cut shape; easy to clean; machine washable finish; anti-slip made of recycled/natural rubber, NBR and other materials; provide for safe and environmentally friendly usage; allows for helping in retaining the position of glasses. Our firm is involved in manufacturing and supplying a huge range of Rubber Mats. We design the given product following industrial standards by making use of best quality material and modern technology. Innovation is our forte and abiding by the same, we manufacture, supply, wholesale, trade, retail and export a vast array of Rubber Grass Mats. The range of mats we offer is acclaimed by the patrons for its smooth finishing and dimensional accuracy. To ensure the high strength of the products, we make use of high grade rubber in the manufacturing process. Padded Mat offered provide for optimum usage support in areas like training areas, athletic field, in exercising spaces and others. Made available in different thicknesses and color choices, the perfect padded finish of these mats also make it suitable for areas like playgrounds. Some of its standard features include featuring resilient surface offering superior durability, provides for soft surface finish that is more comfortable to use in comparison to other hard surfaces, can be offered with extra padding support as demanded by customers, providing for superior absorption of impact in playing areas and others.